For MyISAM one of the most important variables is the Key Buffer. The Key Buffer is sometimes called the Key Cache. It's used as a buffer for the indices of MyISAM tables. There is some overhead in the buffer depending on the configured key block size. This will return the factor, so you have to multiply it with 100 to get the percentage. The Key_blocks_unused is used instead of the more obvious Key_blocks_used. This is due to the fact that Key_blocks_used is the maximum number of key blocks ever used. It will not return to 0 after a FLUSH TABLES. This calculation does not take the overhead in account. 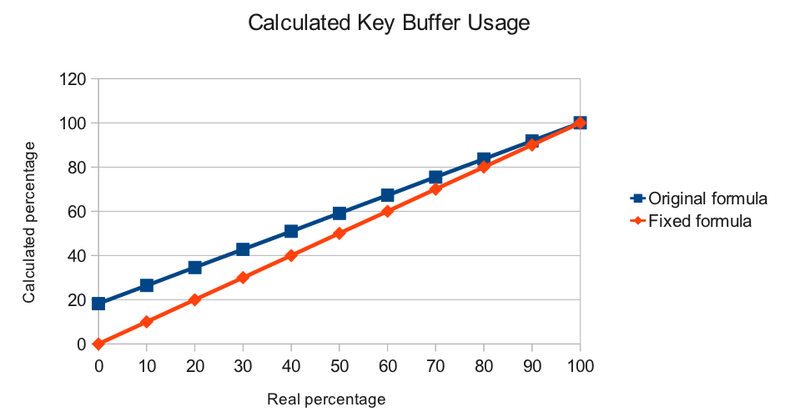 The key buffer efficiency can be calculated if the key buffer is empty or (has been) completely full. The overhead in the key buffer will be allocated on startup, so the larger overhead for a larger key buffer will result in more memory usage, even if MyISAM is only used for the internal mysql tables.